Presented by KRIYATIVE THEATRE, in collaboration with Serbian performer Kristian Al-Droubi, Where the Shadow Ends is a contemporary interpretation of an epic story.The narrative travels through myths and history that are common across cultures, and looks at how myths have turned into history and shaped the moral fabric of societies across the world. 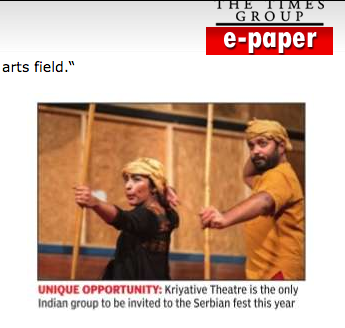 The play explores a South Asian epic story and finds similar stories that exist in Serbia and across cultures. Though the epic acts as the starting point, the play slowly develops into a much more complex layering of socio-political issues of the past and the present. It moves seamlessly between the personal and the political, whilst questioning notions of duty, belief, loyalty, patriotism and patriarchy. The play is in English and uses contemporary movement and text to explore the space between reality and shadows of the past. This experimental work is designed to shock, tease and tickle you into thinking. 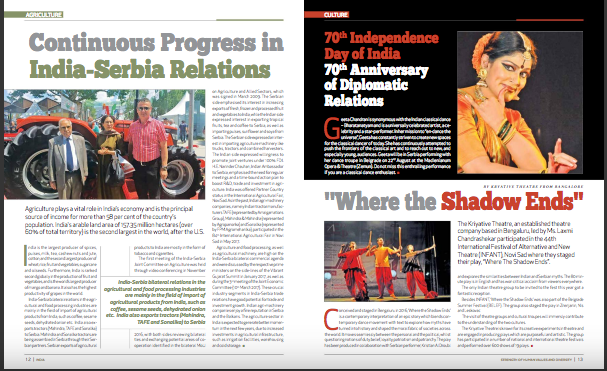 The play premiered at Bangalore’s renowned theatre, Ranga Shankara, in June 2016 and has been well received in India and Serbia. Kriyative Theatre, one of the most popular, bi-lingual theatre groups in the city of Bangalore is known for its creative experiments in theatre. Founded in 2005 by Laxmi Chandrashekar, a prominent theatre person, the group believes in the potential of theatre to facilitate the creation of a better world and is, therefore, engaged in producing plays, which are at once purposeful and artistic.